The Public Utility Commission (PUC) urges electric customers in competitive areas to compare offers and not rely solely upon information given by individual providers. 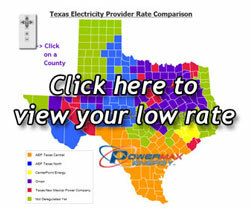 Operated by the PUC, the Texas Electric Choice Web site, www.powertochoose.org , allows customers to make a straight-forward comparison of offers within their particular zip code. For customers without Internet access, free help is available by calling the Texas Electric Choice answer center at 1-866-PWR-4-TEX (1-866-797-4839) toll-free. The PUC also requires each retail electric provider to have an “Electricity Facts Label” that includes standard information about prices and contract terms. The PUC is reminding customers about the free service because of a bill insert sent this month by an affiliate retail electric provider, TXU, to its residential customers in the Oncor service area. While the notice points out a reduction in rates in moving from summer to winter pricing, the notice fails to explain that most other providers also offer similar pricing and that TXU bills will increase when summer rates take effect next year. The bill insert also included a chart showing that TXU has the lowest rate of all major providers in Texas. However, this information is irrelevant to customers in the Oncor service area since competing retail electric providers can offer lower prices than TXU.